There are numerous terms unique to the field of Optometry and Ophthalmology. This glossary is provided as a tool to help patients better understand some of the terminology they may hear doctor's use at Griffin & Reed Eye Care. Always ask your doctor if you have questions about terminology or treatment. Cornea – The clear dome at the front of the eye that is the first element of the focusing system that provides most of the eye's optical power. Custom Ablation – A unique form of the surgery known as "customized ablation," a new technique that allows doctors to precisely tailor the surgery to compensate for the most minute imperfections or aberrations within a person's eye. Custom LASIK – A custom LASIK system is designed to fit a patient's unique visual needs through the use of the CustomVue system by VISX. CustomVue – CustomVue is a safe and effective, FDA-approved method for correcting nearsightedness, farsightedness and astigmatism. FDA clinical trials showed CustomVue offers the potential to enable better vision than contacts or glasses. Dilation – Dilation is the process of widening the pupil. This is done naturally to allow you to see in lower light, and with eye drops so that the eye doctor can examine the back of the eye. Diopter – A unit of measurement of the refractive power of a lens. Glaucoma – A disease of the eye marked by increased fluid pressure within the eye. If left untreated, glaucoma can damage the optic never and cause loss of vision. Since there are usually no outward symptoms, it is important to get regular eye exams at least every two years. Hyperopia – Farsightedness. In the farsighted eye, light focuses in the back of the retina, producing a blurred image. Hyperopia is usually caused by a shorter than normal eye. Intraocular Pressure – The pressure within the eye is determined by how much aqueous fluid is created and drained inside the eye. An increase in intraocular pressure can put pressure on the optic nerve, causing serious vision problems. The intraocular pressure is measured with a tonometer. Iris – The colored part of the eye that is actually a muscle that controls the size of the pupil. Laser In-Situ Keratomileusis (LASIK) – LASIK also corrects the same refractive errors as with PRK. The main difference between PRK and LASIK is that in LASIK, a microkeratome is used to create a thin flap at the top of your cornea. The flap remains attached to the eye, similar to a hinge. By creating a flap, the procedure is virtually painless due to the fact that the epithelial layer is not removed as with PRK. Lens – A natural crystalline disk about the size of a plain M& M (Dr. Reed compares everything to chocolate) that is located behind the pupil that changes shape to allow the eye to focus. As a result of aging, the natural lens hardens, resulting in presbyopia, the loss of reading vision. Microkeratome – The instrument used to create the corneal flap. Monovision – The use of one eye corrected for distance and the other for near vision. This procedure is performed on people over 40 to lessen the need for reading glasses. Eye Motility Exam – An eye motility exam is performed on patients to examine if their eye's muscles or nerve supply have any problems. Having the patient focus on a target like the doctor's finger, while they move it in a large "H" is usually how this exam is performed. Myopia – Nearsightedness. In the nearsighted or myopic eye, light focuses in front of the retina, producing a blurred image. Myopia can be caused by excessive length of the eye itself, excessive focusing power of the cornea or a combination of both. Pentacam – German-developed diagnostic tool for laser vision correction surgery. PhotoRefractive Keratectomy (PRK) – PRK corrects nearsightedness, farsightedness and astigmatism. PRK reshapes the front surface of the cornea with the use of an Excimer Laser. Presbyopia – Refractive condition in which there is a diminished power of accommodation arising from the loss of elasticity of the crystalline lens, as occurs with aging. Usually becomes significant after age 45. Pupil – The black circular opening in the middle of the iris controls the amount of light entering the eye. Refraction – A test to determine the refractive power of the eye. This helps your eye doctor to determine whether or not you need glasses and, if so, how to make them so that you are able to see as clearly as possible. Refractive Surgery – Refractive surgery includes an array of modern surgical procedures designed to improve vision problems, often eliminating the need for corrective lenses. Glasses or contact lenses can correct most vision problems; however, when these are not the most practical solutions, refractive surgery should be considered an effective alternative for improving vision. RK, AK, PRK and LASIK are all forms of refractive surgery. Retina – Thin membranous lining located at the back 2/3 of the eye. The retina's photosensitive cells convert light images into electrical impulses for the optic nerve. The optic nerve sends those impulses to the visual part of the brain. Slit-lamp Exam – A slit-lamp exam is used to detect various diseases of the eye. Using a low-level microscope and a powerful light to shim a slit beam, the doctor can examine the structures in the front of the eye. Topography – A topographical map of the surface of the eye to asses the shape of the cornea. The topographer is used during each patients Laser Vision Correction evaluation in order to determine if the eye is stable to have surgery. A topography of your eye is completely painless. Confrontational Visual Field – Your confrontational visual field has to do with how much you can see. This is measured with the confrontation visual field exam, where you occlude one eye while the doctor slowly brings an object into view, you tell them when you can see it. 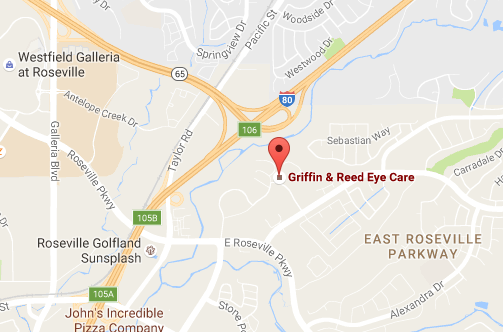 Contact Griffin & Reed Eye Care at (916) 485-2020 for more information on LASIK and vision correction in Sacramento or Roseville, California. 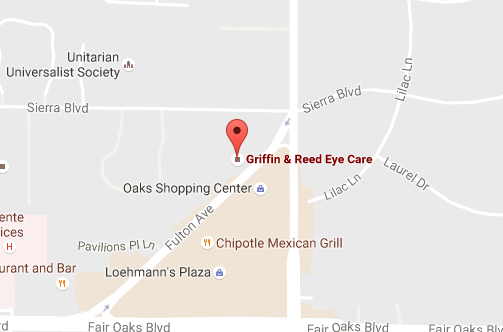 You can also book a LASIK evaluation online!